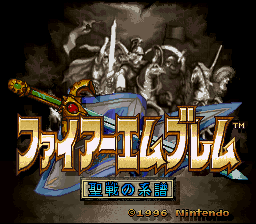 Fire Emblem: Seisen no Keifu, popularly known as “Fire Emblem: Genealogy of the Holy War”, is a turn based strategy game for the Super Nintendo. The fourth game in the Fire Emblem series, developed by Intelligent Systems (who worked on the first four installments of the Metroid series and would later go on to create Paper Mario). It introduced the concept of marriage and children to the series gameplay, which would later return in Fire Emblem Awakening and Fates. In addition to the love system, the game also introduces staples of the series such as the weapon triangle and skill system, granting units extra abilities on the field and in combat. 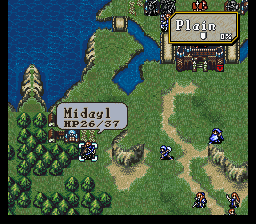 However, the game also has some unique features of its own, such as each unit having their own gold supply and the uniquely large maps: instead of seizing a single castle or throne per chapter like in the previous games, the player instead must seize several castles, with the road to each castle somewhat equating a chapter in most other Fire Emblem games. 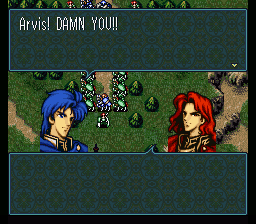 The plotline takes place in the continent of Jugdral and focuses on Sigurd, who becomes embroiled in a sinister conspiracy. Sigurd must endeavor to foil this sinister plot and protect his allies, and perhaps more importantly his own family, as he faces betrayal, deception, love, and loss. 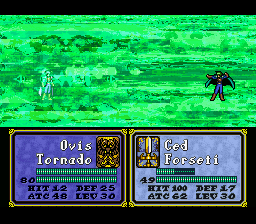 What will the ultimate fate of Sigurd be…? 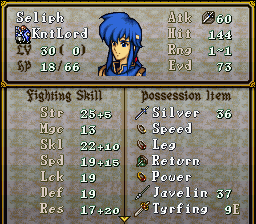 This is a project to take the latest release of the Repatriation line of FE4 patches and update the names to their official English equivalents as of Fire Emblem Awakening. Fire Emblem Heroes name changes (eg: Holyn to “Chulainn”) are not represented. Minor script revisions have also been made elsewhere.